Larry Cherubino is joining forces with Perth’s pasta pioneer, Ada Scaffidi for a night of exclusive wine and authentic Italian fare. 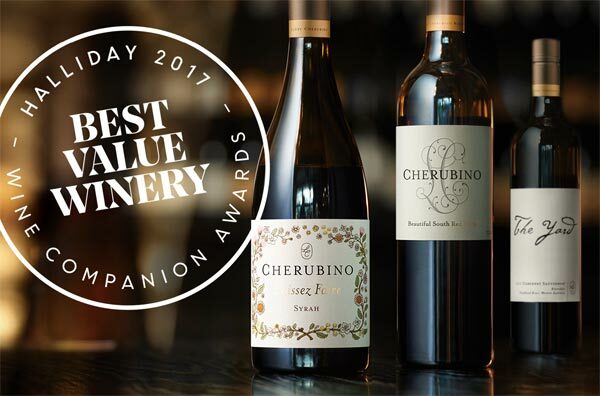 Larry’s work as a travelling wine consultant has taken him to France, Italy, New Zealand, the United States and South Africa before settling in Western Australia to launch Larry Cherubino Wines, recognised as a Winery of the Year by James Halliday. Enjoy an abundant share style menu including Ada’s famous homemade gnocchi as you hear from Larry and taste a selection of exclusive new vintages from his Laissez Faire project of post natural wines. 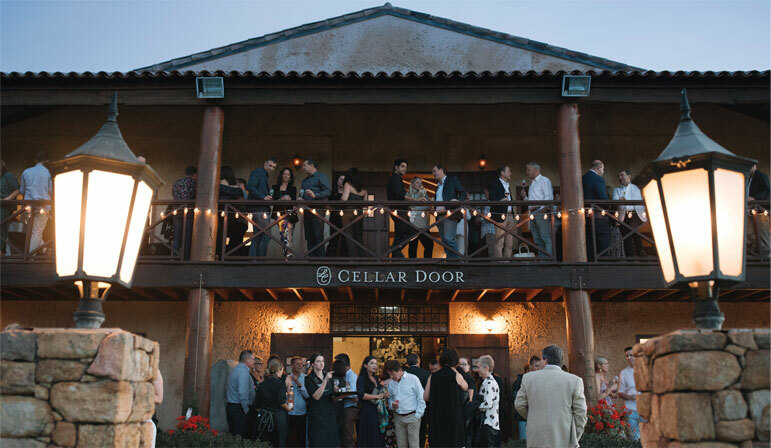 This January ignite your passion for art and wine by making a bee-line to our cellar door on Caves Road, where we will be hosting the Creatives Collide Group Exhibition, a showcase of Western Australia's best creative talent. Supported by Larry Cherubino and South Regional TAFE. Wine Show of WA - Most Successful Exhibitor! 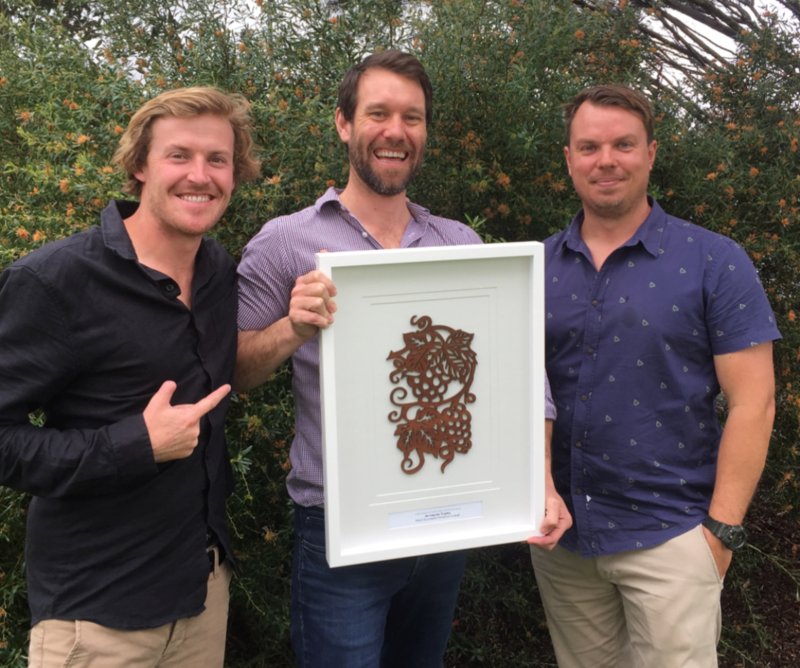 A huge congratulations to the Winemaking and Viticulture team! 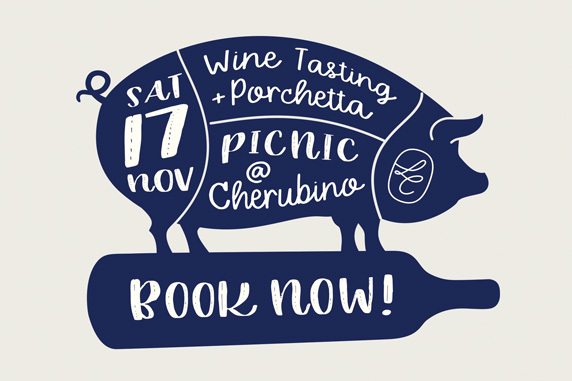 This event will consist of a pre-release Larry Cherubino Wines masterclass tasting with Larry and the winemaking team in the barrel room followed by a porchetta picnic on the lawn. Porchetta is a traditional Italian whole roasted, boneless pig. These will be cooked and carved on site and served with bread, slaw and a range of condiments - generous as only Italians know how to be when it comes to food and wine. Vegetarian/vegan/gluten free options will be available. There will also be a very special unveiling of some hatchling wines that have been incubating in their wine eggs and will be seeing the light of day for the very first time! There will be an opportunity for all tasters to purchase these special wines at some very special prices. Luncheon 12 – 2 pm served with a selection of Larry Cherubino wines. Wine will be available to purchase after this time. Bar open until 4.30pm. **Redeem $25 on any 6 pack of new release wines purchased on the day. 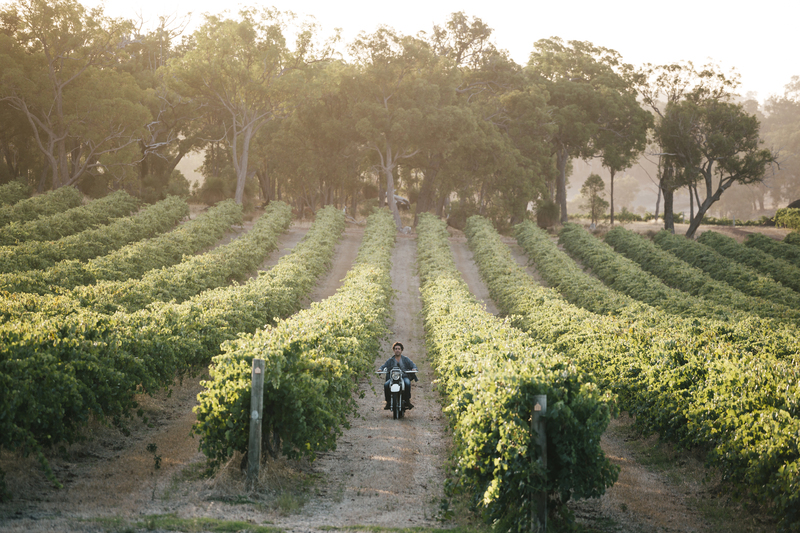 As part of the Margaret River Gourmet Escape 2018, join us on November the 16th for a collaboration dinner by culinary young-guns James Lowe (Lyle’s, London) and Mat Lindsay (ester, Sydney). When James Lowe of London’s beloved Lyle’s (number 38 World’s 50 Best Restaurants) invited Mat Lindsay (Australian Gourmet Traveller Chef of the Year 2018 and chef-owner of ester in Sydney) to cook at his restaurant in 2015, the two chefs hit it off and have been trying to organise round two ever since. Three years later the pair will be reunited for one of the hottest tickets at this year’s Gourmet Escape. 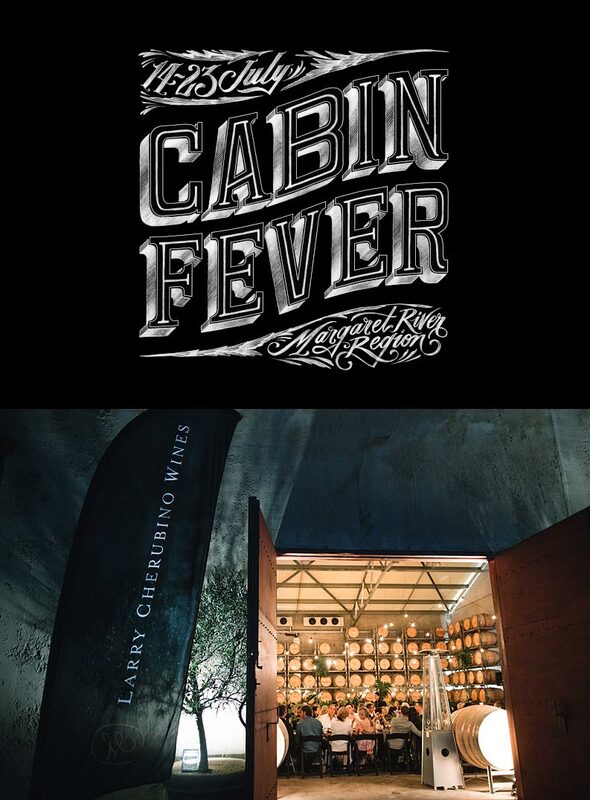 Diners will be treated to an unmissable collaborative dinner in the barrel room of our cellar door. Both visiting chefs are considered some of the most exciting talents in their countries - Lowe, a former head chef at St John (London), proudly champions British cooking traditions while Lindsay is renowned for his intuitive wood-fire cooking – and will be preparing a menu inspired by the award-winning wines from Larry Cherubino. 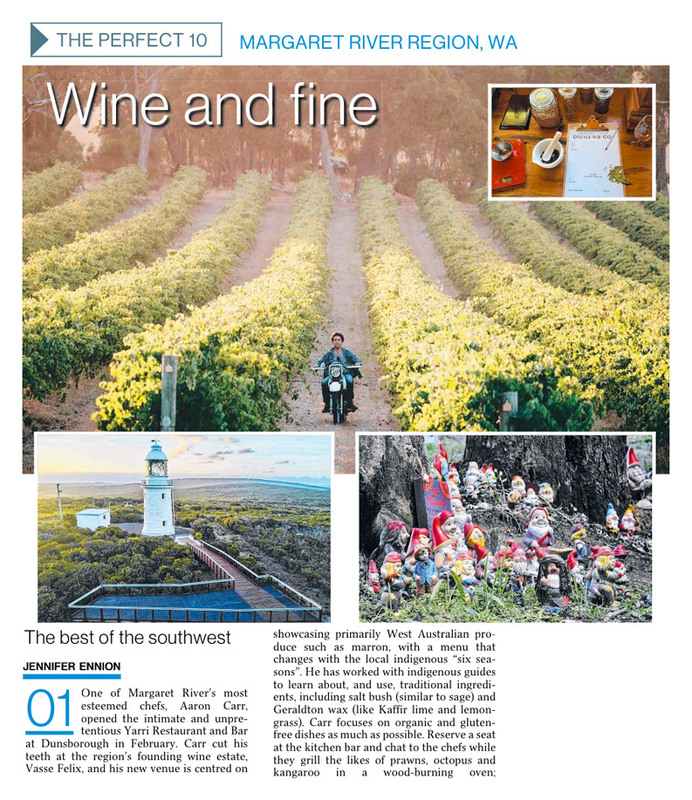 Our cellar door made the Weekend Australian's top 10 best places to visit in the Margaret River region. Jennifer Ennion wrote the article; we've pasted the relevant bits in this PDF. A divine evening at our Margaret River cellar door, as part of this winter's Cabin Fever happening! Indulge in an epic winter feast, with three courses of hearty banquet-style fare, including top-quality cuts of lamb, beef, duck and fish, and other dishes to warm your soul. 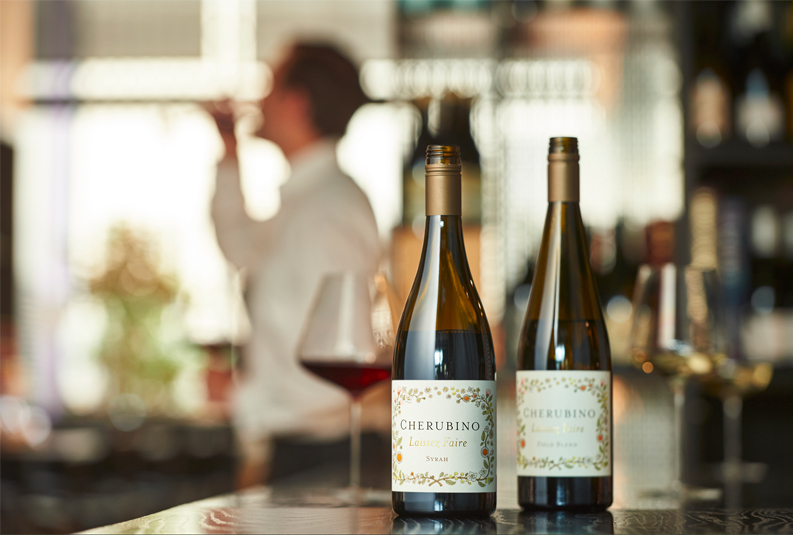 Larry Cherubino's acclaimed wines accompany your banquet, which finishes with decadent desserts and a cheese feasting bar. Your Last Supper embraces everything we love about winter in the South West – hearty food and wine, shared with good people. Note - Back up! MINI Designated Drivers are offered at this event to provide some lucky attendees with an entirely complimentary transport option to and from events. More info on the ticketing page. Our last cellardoor dinner sold out well before the night, so please don't wait to the last moment to book! Gail Williams has written a four page article about us in the Sunday Times. Click here to read it in full. 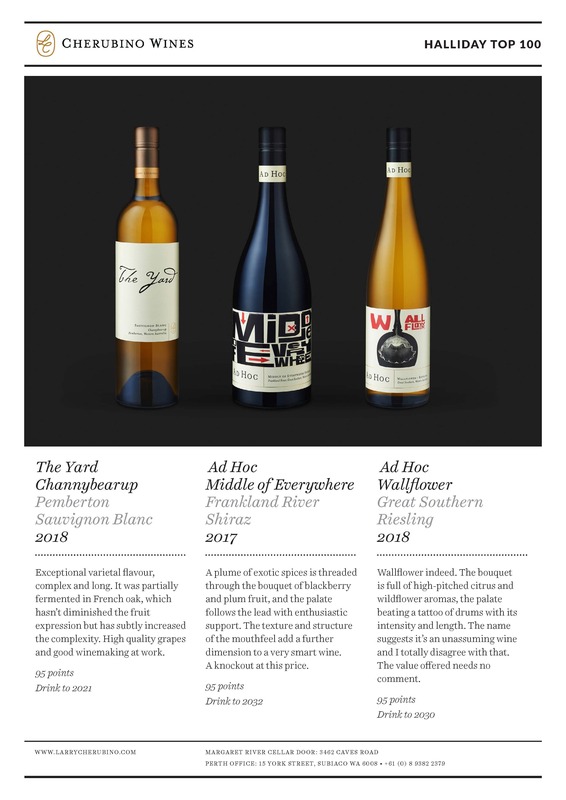 We're pleased to have been listed as one of the best wine travel experiences in the world by Gourmet Traveller Wine magazine! 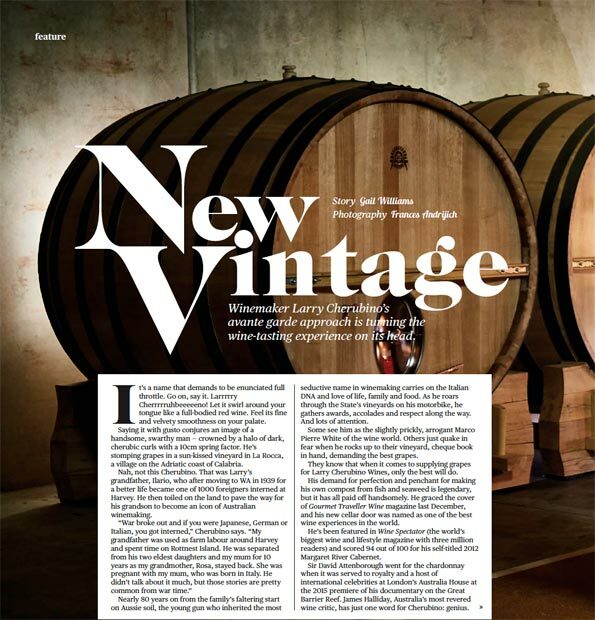 If you're interested in sampling any of the rare and/or back vintages mentioned in the article, we look forward to hosting you at our Margaret River cellar door. Portugal, Spain, Italy; the entire Mediterranean have been the biggest producers and drinkers of Rosé wine for many years. This summer has seen Australia catch-on, with increased consumption and production with stunning rosés coming out of the Margaret River wine region. Enjoy a summer’s afternoon in the beautiful Hay Shed Hill vineyard for a festivity of good food, Margaret River rosés and great music. 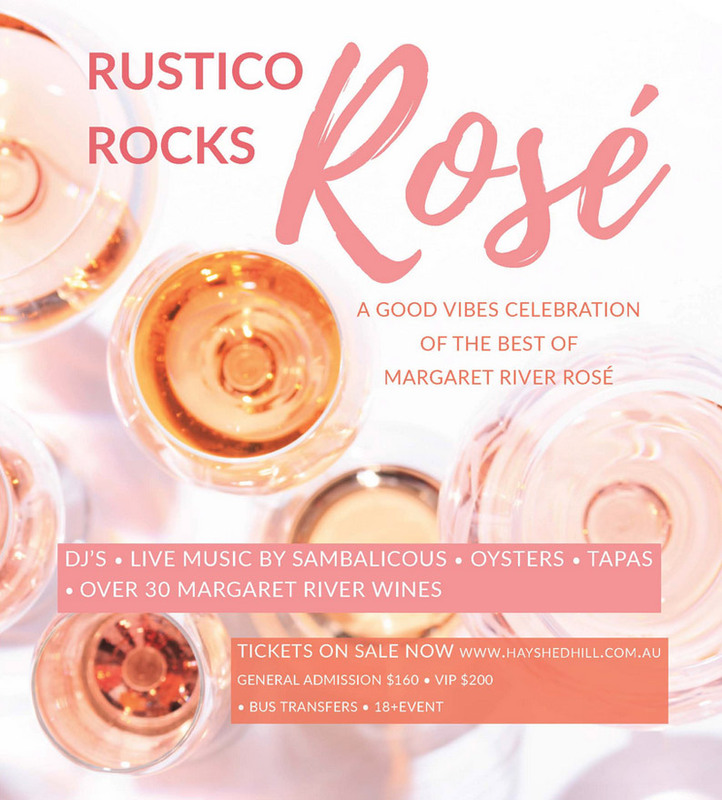 Get your friends together for what is the first of our Rustico Rocks Rosé events. We’ve teamed up with five of the best of Margaret River rosé producers to give you a unique tasting of more than 8 rose’s from the region. There’ll also be rosé Sangria and Froscato and over 30 premium Margaret River sparkling, white and red wines on offer, plus beer and cider on tap. Rustico at Hay Shed Hill, will present over a dozen tapas dishes inspired by coastal Mediterranean dining which have each been carefully deigned to pair perfectly with rosé wine. The menu has considered all taste buds with plenty of beautiful fresh summer dishes with a focus on seafood, mezze and seasonal vegetables and completely gluten free with something for everyone. DJ Mandy Bubb will kick off the day and once warmed up the party starters ‘Sambalicious’ a Brazilian Samba Funk band will hit the stage. You’ll be dancing and partying the afternoon way. General admission tickets come with five tapas food tokens and five wine glass tokens. VIP tickets include premium reserved seating, oysters on arrival, rosé sangria and 5 food and 5 drink vouchers. Additional food and drink vouchers are of course available all day to purchase at the event so you can make your way through the menu and decide which food and wine matching is your favourite. Bus transfers are available from Busselton, Dunsborough, Cowaramup and Margaret River. To celebrate 8 years of Rustico Tapas Restaurants, we’ve added a special DAY TRIP service from Perth, departing from Rustico Rockingham Beach at 9am and returning at 9pm the same day. Larry Cherubino and New Normal Bar + Kitchen would like to invite you to a very special evening celebrating shared desires to facilitate a Laissez-faire relationship between our existence and the bountiful environment around us in the Southwestern Australian eco-region, one of the world's top five biodiversity hotspots. On this evening Larry will launch his new vintage of low intervention Laissez Faire wine, paired with a menu sourced exclusively from Australia's Southwest prepared by Charlie Vargas of the New Normal Kitchen. Community building, intelligent conversation and a good time are all on the agenda. This very special five course menu with paired wine is limited to 28 guests only. Credit Card details will be recorded at time of reservation and charged after sitting. Cancellations are only possible 72 hours prior to the event for a full refund. All other cancellations will incur full seating cost. We are very excited to announce that we will be hosting an event at this year’s Gourmet Escape at our new cellar door! The event will be a long table banquet held in our barrel hall, prepared by outstanding chefs with a shared love of Latin American cuisine. Chef Alex Atala of Brazilian restaurant D.O.M. - recently listed No. 16 in the World’s Best Restaurant list - is joined by Elvis Abrahanowicz and Ben Milgate of Sydney’s award winning Argentinian restaurant Porteno as well as local chef Rhys Passmore of Supper Road to create a menu of fine Latin flavours. This will of course be matched to our wines as well as craft beers from Colonial Brewing Co. This promises to be a very unique evening as well as being an opportunity for us to launch our wonderful new Margaret River venue. 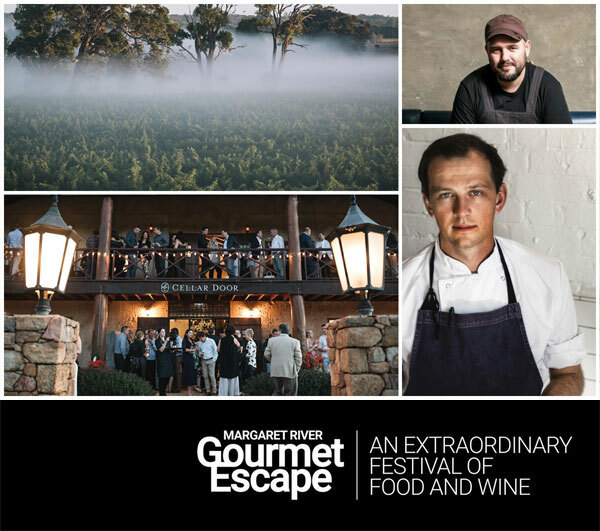 *Tickets are available through the official Margaret River Gourmet Escape website only and are on sale now so don't miss out. Win a Wine in the Wilderness trip for two worth $16,500! 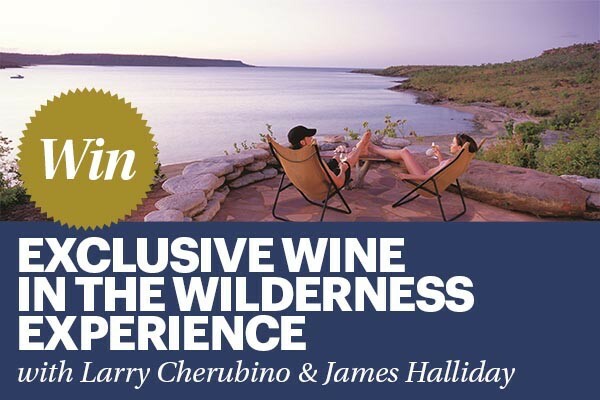 In partnership with Halliday Wine Companion, Larry Cherubino Wines is giving you the chance to win an unforgettable four-night gourmet experience for two in the Kimberley valued at $16,500. You and a guest could be jetting off to the award-winning Faraway Bay wilderness retreat in northwest WA on August 7-11 to sample best-in-class wines, dine on chef-prepared meals and explore the landscape Sir David Attenborough described as “unlike anything else in the whole wide world”. Tastings hosted by Larry Cherubino himself will feature both Australian releases and international benchmark wines. In between all the indulgence you’ll have the opportunity to join fishing trips, swim in spring-fed rockpools, cruise to the iconic King George Falls and see some of the oldest rock art on record. Alternatively, you can simply relax by your clifftop cabin, looking out across the bay while uncovering features of a highly rated wine you may never have noticed amid the hustle and bustle of daily life. You may even pick up some tips on refining your palate from the one and only James Halliday while he’s in camp. With places limited to just 16 people each year, this is rare opportunity to indulge your love of wine, food and travel with one of Australia’s leading winemakers playing sommelier. So, what are you waiting for? Return transfers to Faraway Bay including scenic Chartair flights. Four nights’accommodation in a clifftop cabin with ensuite (double or twin) at Faraway Bay. All meals, beverages and snacks while participating in scheduled activities. A range of guided activities including boat trips, bushwalking, birdwatching, stargazing and an indigenous art tour. *NT residents fly from Darwin to Faraway Bay via private charter. **WA residents fly from Perth to Kununurra and overnight at Kununurra Country Club before transferring to Faraway Bay via private charter. Inspired by a love of fresh ingredients, her grandchildren and the joy of cooking for others, Natalina has compiled her story into 370 pages of memories and photographs with over 60 recipes from the heart. 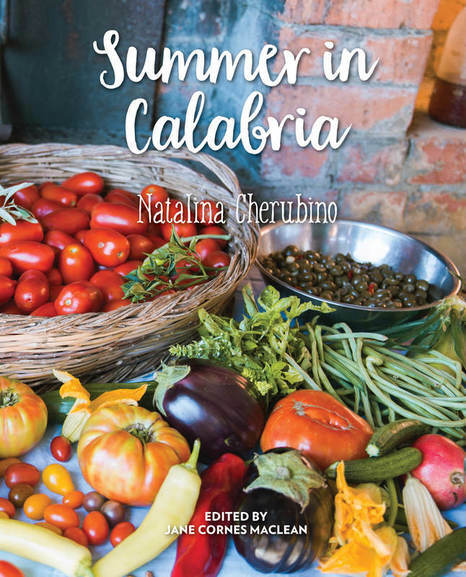 Summer in Calabria' tells the story of Natalina's return to the remote southern Italian village of La Rocca, where she was born. After nearly six decades of living in Australia, Natalina knew she had come home. 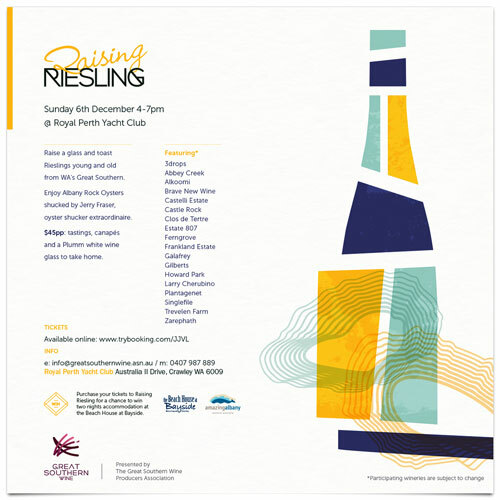 Raise a glass and taste Rieslings young and old from WA's Great Southern. Enjoy Albany Rock Oysters shucked by Jerry Fraser, oyster-shucker extraordinaire. $45pp: tastings, canapés and a Plumm white wine glass to take home. The best Great Southern winemakers are coming to the State Buildings, with a pop-up wine market in Postal Hall. 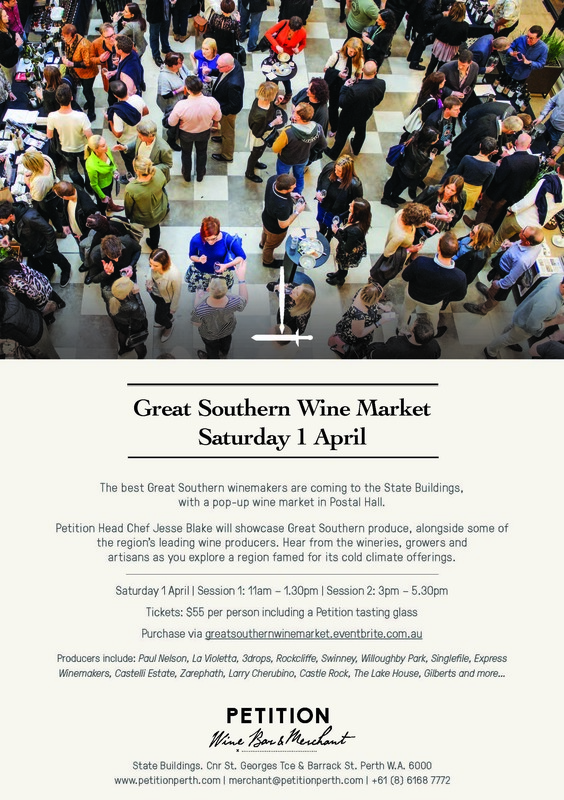 Petition Head Chef Jesse Blake will showcase Great Southern produce, alongside some of the region’s leading wine producers. 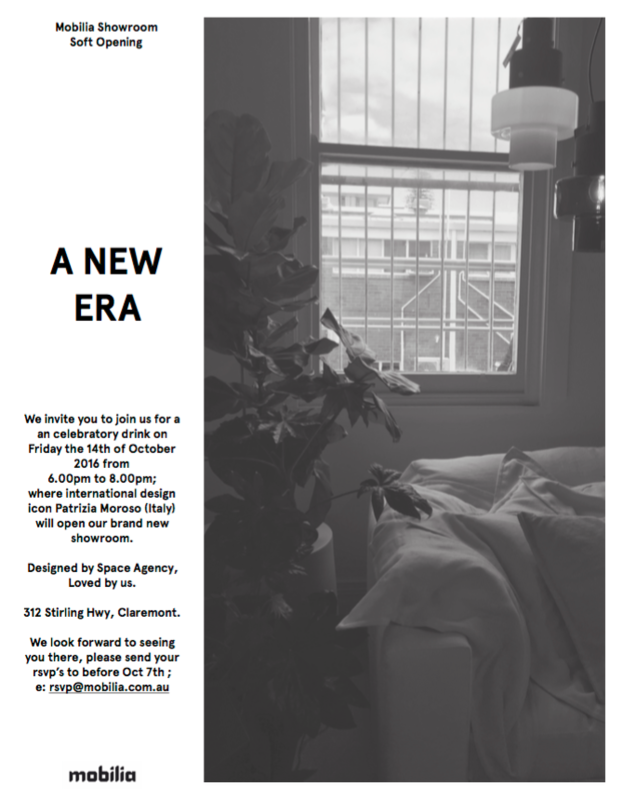 We're happy to be sponsoring the celebratory drinks for Mobilia's new showroom opening. Space Agency designed the room, and Patrizia Moroso from famed Italian furniture company Moroso will be speaking. 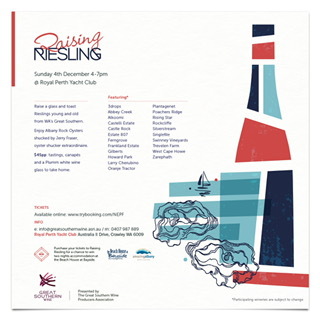 If you love Riesling and want to taste some of ours as well as others from the Great Southern Region, make sure you go to www.trybooking.com/JJVL to buy your tickets! 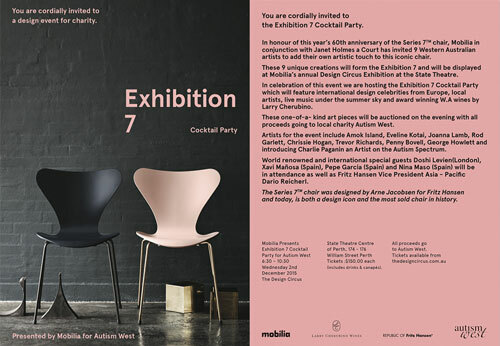 Larry Cherubino Wines is happy to announce that we will be sponsoring the Mobilia Exhibition & Cocktail Party next month. To celebrate the 60th anniversary of one of the most iconic chairs in history, the Series 7, nine WA artists will be adding their own artistic flair to these iconic pieces which will then be auctioned off with all proceeds going to Autism West. 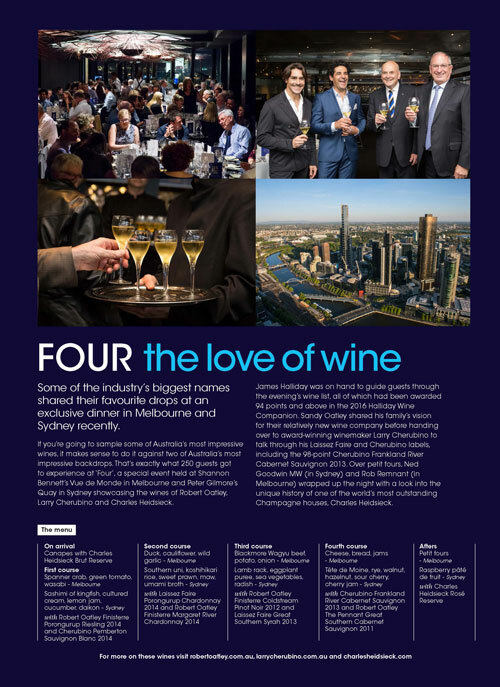 Larry’s wines were presented at a James Halliday led tasting at Vue De Monde in Melbourne, and Quay Restaurant in Sydney alongside Robert Oatley and Charles Heidsieck wines. BE A WINEMAKER FOR A DAY! If you've ever wanted to make your own wine, now is your chance! 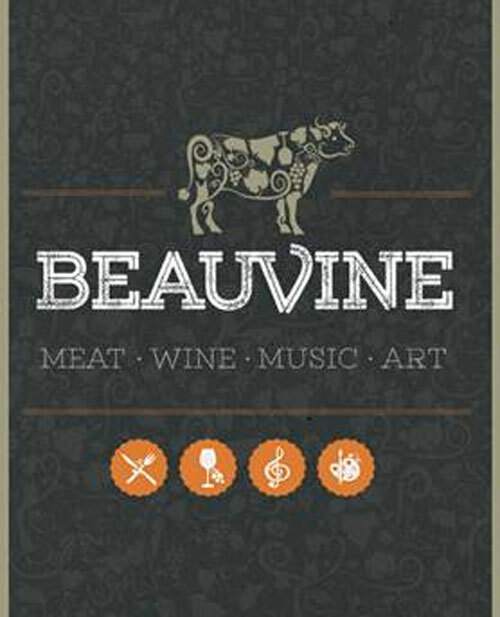 Under the guidance of WA’s renowned and most awarded winemaker Larry Cherubino, at the Beauvine Festival’s special blending laboratory masterclass you will have the opportunity to create your own wine. With a selection of barrel samples at your disposal and with Larry's instruction and support you will become the winemaker. Larry will discuss the challenges, identify features of each barrel sample and explain what to look for when combining these components on the creation of your very own blend. A $50 Larry Cherubino Wine voucher will be given to each attendee of this class.